When it comes to a traditional Thanksgiving meal, I love it all. Turkey, cornbread dressing, mashed potatoes, yams, pumpkin pie. I love it! Every last bit of it. But truth be told, I could eat green beans, a green bean casserole to be exact, any time of the year. There is just something about the flavors that all come together to make it the classic dish that it is. For years now I’ve kind of taken over making the green bean casserole at our home for the holidays because I love it so much. And except for one year, I’ve made it the traditional Campbell’s way. But I’m always looking to make a traditional dish a little different and did that with this casserole. 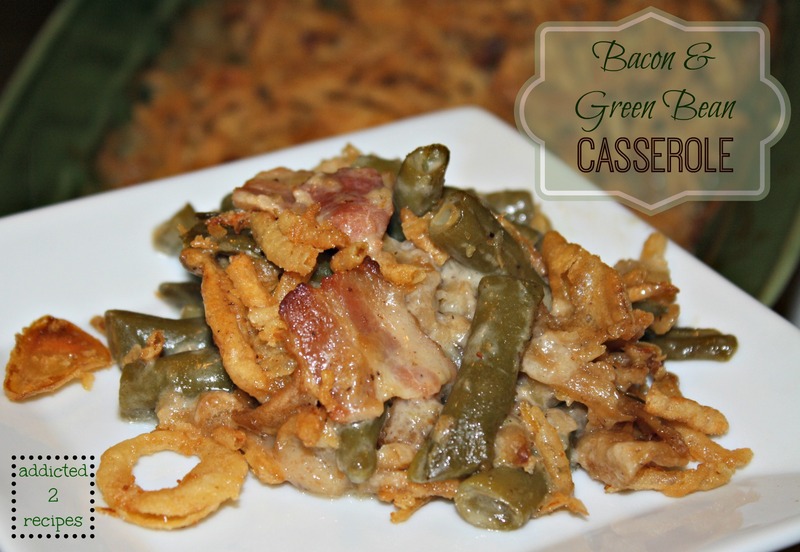 I saw on Pinterest the recipe for the Texas Roadhouse Green Beans and knew I wanted to incorporate that with the traditional green bean casserole. Whenever I go to the Texas Roadhouse, I always make it a point to get their green beans because they are so good. Now I can have them at home! I am so glad I incorporated their recipe with the traditional one. The bacon flavor added to the dish takes it over the top. In fact, I saw both my mom and dad going back for seconds on it when I made it for them for dinner this week. It’s sure to be a favorite at our Thanksgiving meal. In a large sauté pan, cook bacon until almost done, stirring to ensure bacon doesn’t burn. Add onions and sauté for about 5 minutes until onions are browned. In a small bowl, add water, sugar and pepper. Whisk together then add to bacon and onion mixture. Add beans to pan and mix together. Pour in cream of mushroom to the pan and half the fried onions. Stir together to combine then take off the heat. Pour in a casserole dish and cook for 25 minutes. Pull dish out and mix around then add the remaining fried onions on top. Cook for an additional 5 minutes.